Whenever I move to a new town, I look for a beautiful place where I can read, think and smoke a cigar. 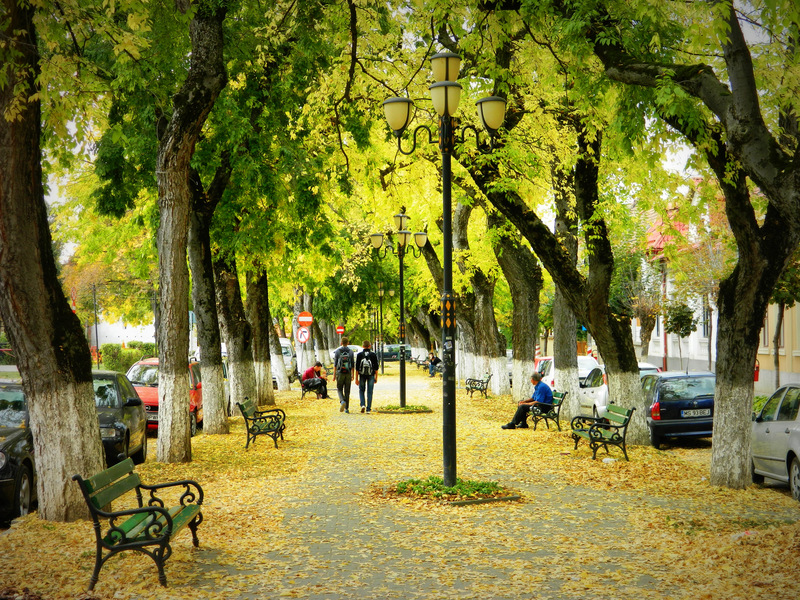 In Târgu Mureș in Romania, you can find me on one of the benches of this romantic tree-lined boulevard, lost in a novel and puffing clouds of smoke into the sky. Only the many newlyweds who come from all around the world to misappropriate Europe’s most romantic boulevard as a backdrop for their wedding pictures disturb the serenity. These photos were taken when I moved here in October. By now, the leaves have turned yellow. With every burst of wind, the trees are shedding more of them. Soon, the first snow will fall and it will look particularly romantic at night. Which it already does now. Whenever I walk up or down this boulevard, I am thinking of my friends in Hollywood because it’s exactly the kind of street they would love to use as a film location. Oh, you want to know the exact address now? It is Bulevardul Cetăţii, behind the medieval fortress in Târgu Mureș. This entry was posted in Photography, Romania, Travel and tagged Targu Mures. Bookmark the permalink. Such a lovely collection of photos! 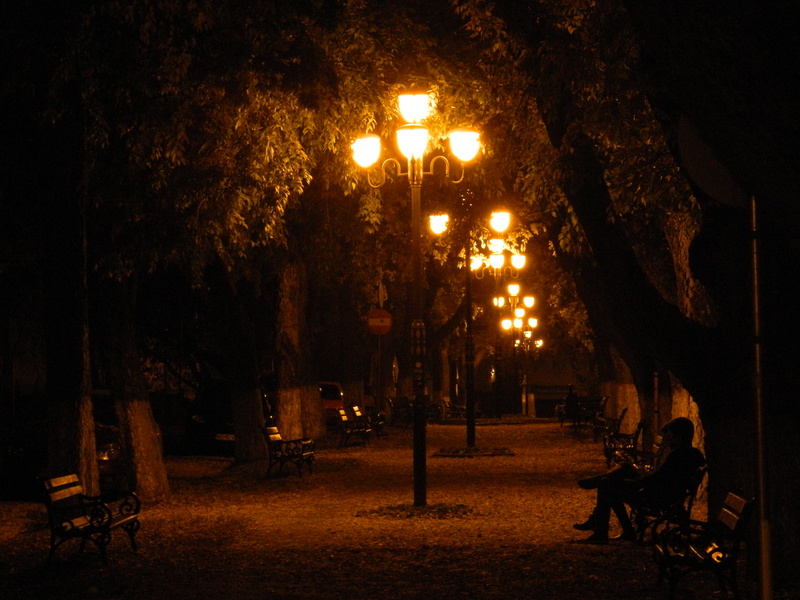 There are much more romantic places in Targu Mures, this is only one of them. There is also a beautiful place near “weekend”(in 7 Noiembrie) where the river Mures offers a romantic view. On the other part of the street there is a place with carting cars. It should help you find it. And then, going in the opposite direction, there is a boulevard recently built that floats along with the same river. And there is also Platoul Cornesti wih a large park and zoo and a tremendous view of the city especially at night. 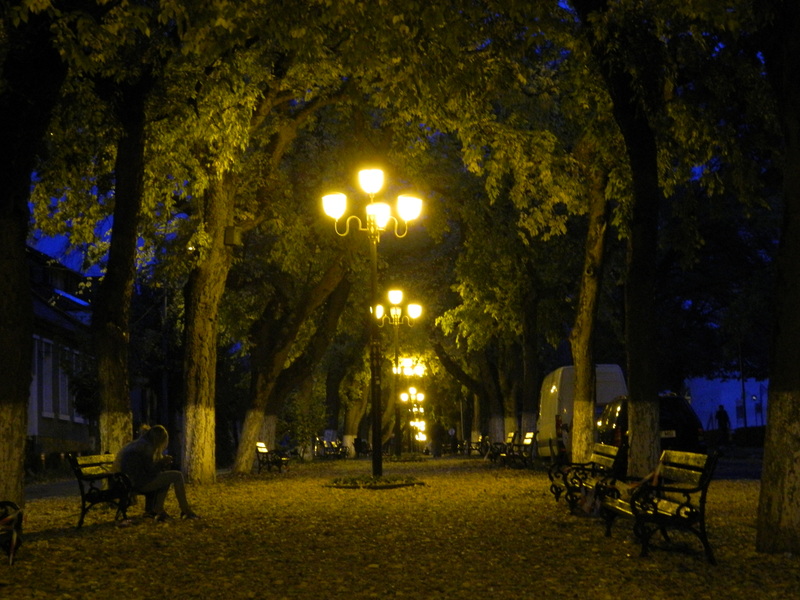 This boulevard was establisment in the period of Hungarian Kingdom,the hungarian people, by Bernády György, the maior of city Marosvásárhely (Tirgu-Mures after the Trianon shame-treatment) in the year of 1912. I’m living in an old hungarian house near this boulevard, but the great problem is: the paranoic and criminal maior of the present day in Tirgu-Mures – Dorin Florea – wants to cut every trees, and destroy this boulevard. He is a romanian gipsy came from another territory of Romania, and not an inhabitant of this city. PLEASE HELP US TO SAVE THIS BOULEVARD ! Because the hungarian people is now in minority, they don’t have a force against this romanian barbarism,vandalism, represion and brutality ! Wasn’t Hungary part of Austria in 1912? Unfortunately, your racist rant shows why the people of Targu Mures/Marosvasarhely won’t get together for a protest. And in the end, the trees will be cut because nationalists like you find it more important to distort history. I will still be here until May 2015 because I have made this cute town my temporary home for this fall/winter/spring. You have great landscape and nature photography in your Flickr portfolio! It looks like you would also know some beautiful spots for hiking and exploring nature. have you visited the zoo? it’s AMAZING! Not yet. I always feel sorry about the animals in zoos. But I guess I should pay a visit, if only to find out how to best liberate the animals from captivity. Wow, there are beautiful shots, and you captured some amazing colors! Thank you. I was was born in Targu Mures, and I’ve had plenty of time to explore it (some of the landscapes are from the farther reaches of Mures county, but most are close by). I’m so glad that you enjoy the town and also my way of portraying it (most of the photos are shot on film, which in my opinion is the best way to capture this town….feel free to explore my photostream whenever). Aww, this is my hometown! I live at a street’s distance from the Boulevard! Thank you for the lovely words of praise! :) I am so happy you like the street as well! If you live so close, I am sorry if the cigar smoke became too much on some days. Now that it has gotten cold, you are getting a few months of reprieve. I can’t smell any cigar smoke. The Combinat factory is all anyone can smell in the city nowadays sadly..
Is this the factory: https://andreasmoser.wordpress.com/2014/10/07/sunset-factory/ ? Of course it is. I live on the top of the hill next to the Boulevard, and every morning when I look out my window instead of seeing my pretty little hometown I can only see a few tall buildings and a huge cloud of whatever that factory is emitting.. It’s becoming a real problem and everyone just seems to ignore it. I live on Bulevardul 1848 opposite the Unitarian Church at Piaţa Dávid Ferenc, and I have a direct line of view to the factory as well. On some days I can’t see the hills outside of town because the clouds of smoke blur any difference between the earth and the sky. Now you are making me curious! I read that the factory emitted/emits much more ammonia than permitted. Is there any environmental organization in Târgu Mureș? Hi, there, regarding to the factory, they better pay the fine instead of investing in filtration, in this way the costs are lower… sad but true. Btw, I also live in the same neighbourhood right near the unitarian church and I can smell the pollution especial afternoon and before dark, the air is getting heavy. I understand it from the factory’s point of view. But I don’t understand it from the government’s point of view. If the pollution limit is exceeded, then the pollution is getting dangerous (especially when the wind blows the smoke towards the city, which it seems to do almost every day). Charging a fine in this instance is like charging a drunk driver a fine each time, but handing him back his licence and his car. Imagine people running around with guns and shooting at people, and they would just need to pay fines in order to continue running around and shooting at people. A payment like that is less of a fine than a fee for a permit to poison the population of Târgu Mureș. Nice to see that our health has a price, at least. Oh my God!!! I’ve spent all my teen years on Bulevardul Cetății….my high school is on that boulevard!!! Thank you for honoring the place that brought me some of the most memorable experiences in my life! Enjoy your stay in Târgu Mureș! Reblogged this on Simona Prilogan. And not only oxygen, but also memories, beauty, the soul of a town. If anyone ever wants to cut down these trees, I have the impression from the many comments that there are enough of us willing to chain ourselves to the trees to prevent that. Count me in! Our “beloved” mayor killed a few trees on a Saturday when there is nobody at the City hall to give any information about what did these trees do to deserve this fate. Uggh! That was one gruesome movie! But true, the trees in town should have a chance to fight back! That’s a much nicer idea! And over time, you will grow a small forest this way. I’m from Iran, we have lots of wonderful places here. nice to see you in Iran soon. I agree that Iran has very beautiful places, and above all, the most amazing people and hospitality. I have been to Iran twice and both were very memorable trips. 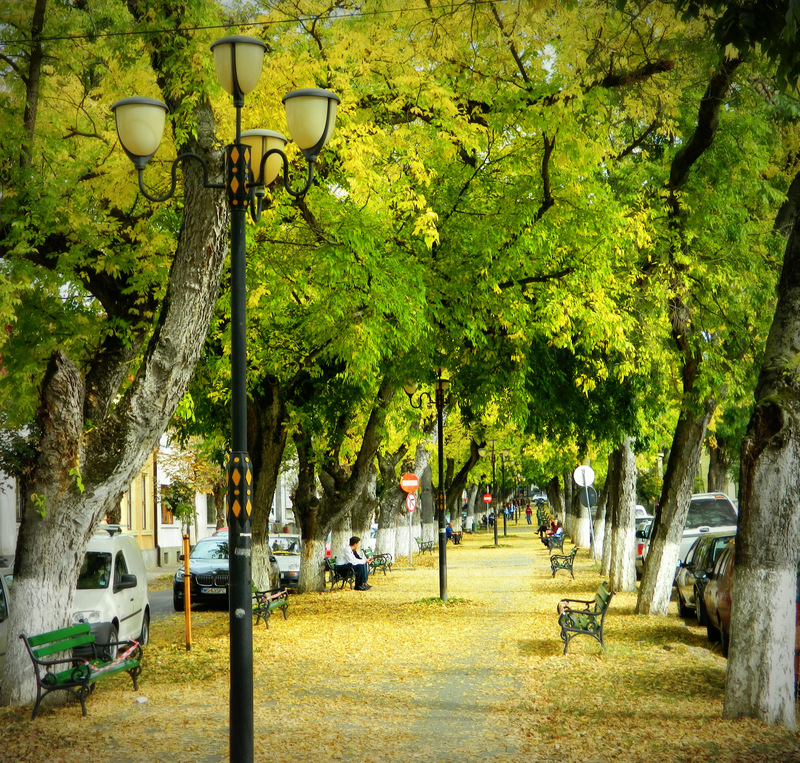 It’s my favorite city and also one of my favorite streets from Targu Mures. I visit the city every year and there is the place where I can recharge my batteries. It’s very beutiful this is a boulevard. Dear Author! 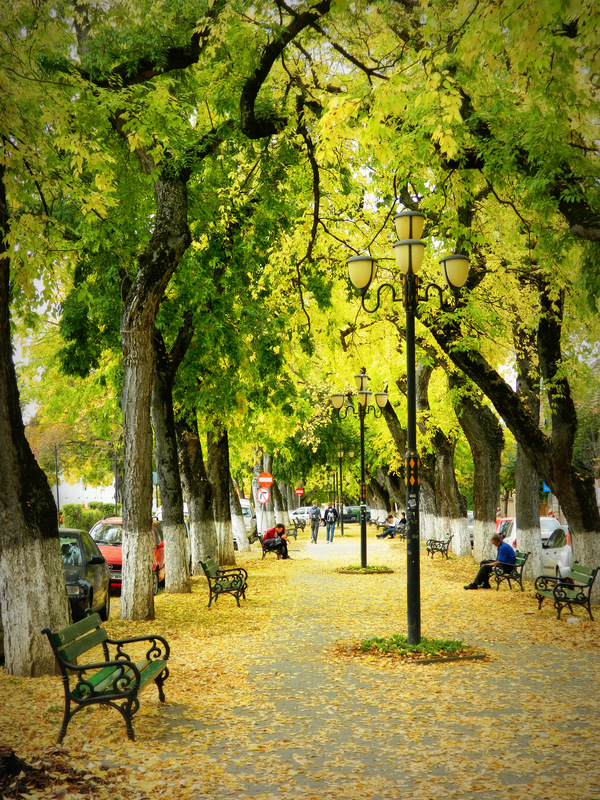 Thank you very much you highlighted a little Transylvanian town’s promenade, make me feel pride to read about it. I am only miss from your blog to mention of he town’s origin Hungarian name: Marosvásárhely. As you may know this town is so called capital of Szeklerland (Székelyföld, Tinitul Secuiema). Hungarians recently are oppressed and restricted in very field of the life and main purpose of the current government to assimilate them, so to mention of the town’s origin name as it is called by its inhabitants would be a nice, respectful motion. Thank you to take into consideration of my comment. However the mayor of the city wants to cut the trees to transform to a new and modern public space. Unfortunately Attila is right, the mayor, nicknamed The chainsaw-handed, wants to give a futuristic image of this beautiful boulevard. This is the single promenade in Europe with so much Hackberry trees, but it seems he is not intereseted in such “minor” things. His men are cutting trees all over the town and nobody can stop this. From taking part in the debate, talking to friends and colleagues about it, staging activities on our favorite boulevard, and if nothing else helps, we can chain ourselves to the trees. I am currently traveling in Israel, but I will be back in Targu Mures on 23 April. Then I’ll get active! The massacre has started in Tirgu Mures!!! HAT KEREM SZEPEN A SOK MAGYAR MIERT NEM BESZEL MAGYARUL DE ROMANUL IS LEHETNE TERMESZETESEN MI MIND A KETTOVEL OTTAN NOTTUNK FEL! Hello,Andreas! Thank you for the amazing photos of my favorite place on earth. I felt like I was back to my childhood when I spent so many great moments over there with family and friends. Seeing those made me feel so close to home… Thank you! Doar niste nori plutesc in zare. i used to buy weed and smoke it right on that bvd. Hi, i’m from Tirgu Mures, was born here.